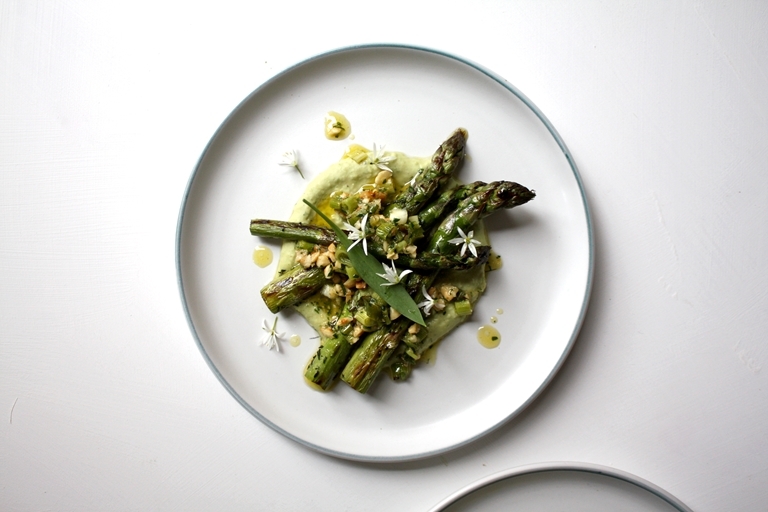 Joey O'Hare serves up a stunning salad of asparagus, served atop a cannellini bean hummus recipe delicately flavoured with seasonal wild garlic. A spring onion and hazelnut pesto top off this elegant vegan starter beautifully, with the spring onions lightly roasted to bring out their natural sweetness. This recipe is a celebration of two ingredients that are the very definition of early summer. I was extraordinary lucky recently to go to L’Enclume with a friend; the hedgerows surrounding Simon Rogan’s 'Our Farm' were bursting with wild garlic and we couldn’t resist picking a bunch to bring back to London with us. That very weekend English asparagus appeared at my local farmers’ market for the first time and I couldn’t wait to pair the two together. Here, the asparagus spears are simply grilled in a hot pan to char well but retain a good bite, and the wild garlic is whizzed through a white beans hummus. They combine here to make a wonderful starter for four people, or a hearty salad to serve with some leafy greens and fresh bread perhaps, if you are looking to serve this as a meal in itself.